AllegroMedical.com presents The SinuCleanse Nasal Squeeze Bottle System. 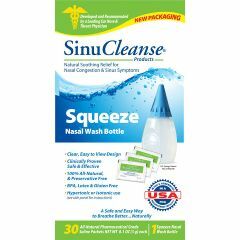 The SinuCleanse® Squeeze Nasal Wash System provides its patented ergonomic designed Squeeze bottle that allows you to control the flow of the all-natural SinuCleanse® Saline solution, while its anti-backflow technology and wide-mouth design help to prevent contamination and allow for easy filling and cleaning. In addition, its clear-view design enables you to view the water level and make sure the saline is completely dissolved prior to nasal washing. The SinuCleanse® Squeeze bottle has a comfortable tip, to fit every nose. The SinuCleanse® Pharmaceutical Grade Saline Packets contain all-natural, preservative free, ultra-fine salt granules which dissolve instantly, making nasal washing comfortable and easy. SinuCleanse® Pharmaceutical Grade Saline Packets can be used as either Isotonic or Hypertonic solutions. Check with the guide or consult with your physician for best use. An Isotonic Solution creates a mild, less concentrated salt solution of 9mg of Sodium Chloride per mL of water, which has a similar salt concentration as your body and may be more comfortable to use for some people initially compated to the more concentrated Hypertonic solution. A Hypertonic Solution creates a higher more concentrated salt solution which is similar to the salt content in ocean water.